ICC Color Profiles for Mac Displays are quite difficult for any untrained human to set perfectly as Mac, Macbook Pro has higher resolution and needs calibration.ICC Color Profiles for Mac Displays are by default not set to optimum as Mac is designed for various professionals and Apple lefts them to the hand of the user. But, finding the right ICC Color Profiles for Mac Displays is quite tough for a new user. Here is a guide for an average user to set ICC Color Profiles for Mac Displays to the optimum. If you want to create a good / natural looking ICC Color Profiles for Mac Displays manually, click that Calibrate button. It is the eye blinding process to create and tune your display. It is the last way if you can not get the below mentioned ways for yours one. Do not calibrate for longer times, blink frequently, if you try and try for more than 15 minutes on average, it can make you nauseating due to too much visual stimulation. If you are seeing a different feeling webpages, as if the colors has been washed out or not like that you have seen before, it is not calibrated. But, where to get the optimized ICC Color Profiles ? Creating optimized ICC Color Profiles is not that easy and cheap. It requires quite costly hardware and/or software to create ICC Color Profiles. You will find helpful persons are distributing their profiles on forums, blogs, Github like coding repos, from Adobe, Canon etc. websites. ICC is not itself closed source. But you can steal that of others’ without their permission. The best profile is quite obvious can be grabbed by setting up a ‘personal relationship’ with Apple Store guy and getting theirs. It is a bit tricky, but not really difficult. This Article Has Been Shared 8059 Times! 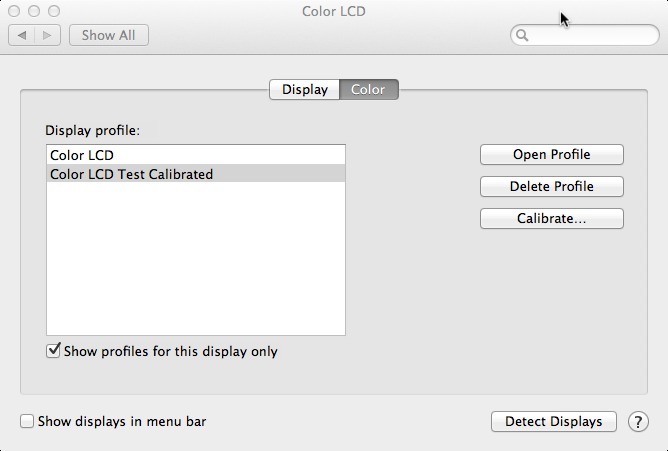 Cite this article as: Abhishek Ghosh, "ICC Color Profiles for Mac Displays : Calibrating and Tuning," in The Customize Windows, November 20, 2012, April 18, 2019, https://thecustomizewindows.com/2012/11/icc-color-profiles-for-mac-displays-calibrating-and-tuning/.